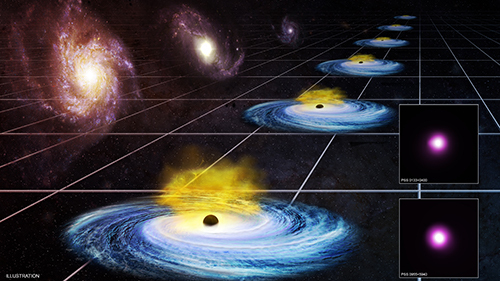 A pair of astronomers has found evidence that dark energy may vary over time. If confirmed, this result could force astronomers to re-examine their fundamental understanding of the history and structure of the Universe. This new study uses X-ray data from NASA's Chandra X-ray Observatory and ESA's XMM-Newton along with optical and infrared data from the Sloan Digital Sky Survey. First discovered about 20 years ago by measuring the distances to exploded stars called supernovas, dark energy is a proposed type of force, or energy, that permeates all space and causes the expansion of the Universe to accelerate. While the exact nature of dark energy is unknown, many astrophysicists think it is constant throughout space and time. The latest result involves the development of a new method to determine distances to quasars, rapidly growing black holes in the distant Universe that shine extremely brightly. This method, which used data on about 1,600 quasars, allows astronomers to determine distances to quasars that are much farther away from Earth than the observed supernovas. The astronomers observed quasars back to just a billion years after the Big Bang, and found that the Universe's expansion rate up to the present day was faster than was expected. This could mean dark energy is getting stronger as the cosmos grows older. This is a new technique, so the researchers took extra steps to show that this method gives us reliable results. They showed that results from our technique match up with those from supernova measurements over the last 9 billion years, giving us confidence that our results are reliable at even earlier times. Still, more research is needed to confirm this exciting result. The researchers plan to use a large sample of Chandra observations of quasars at a wide range of distances and apply this same technique. The nature of dark energy, a force or energy that accelerates the Universe's expansion, is one of the biggest mysteries in science. Scientists discovered dark energy 20 years ago when they studied the distances of supernovas. 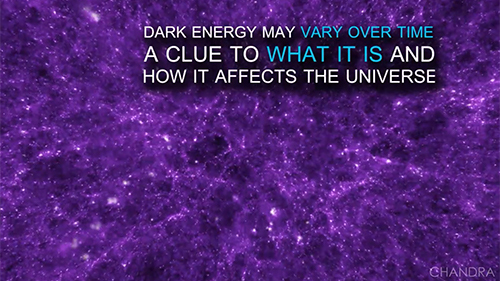 Since then, scientists have been trying to figure out what dark energy is and how it behaves. A new study using X-ray data from the Chandra X-ray Observatory and XMM-Newton and SDSS data may be a step in that direction. Using quasars — rapidly growing black holes — researchers were able to track dark energy's effect back to just about one billion years after the Big Bang. If confirmed, this result shows that dark energy may vary over time, giving an important clue as to what it is and how it affects the Universe.